OUR PROPELLER MOUNTED SYSTEMS ARE MEANT FOR MEDIUM TO LARGE VESSELS. THEY INSTANTLY CUT LINES AND NETS BEFORE THEY BECOME ENTANGLED. THIS PREVENTS AFT SEAL RUPTURE, RESULTING OIL POLLUTION AND OTHER COSTLY DAMAGE TO YOUR VESSEL. 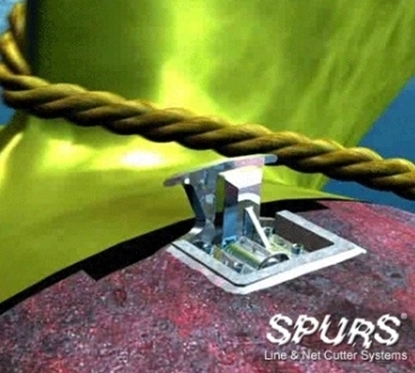 SPURS® manufactures cutter systems for fixed & variable pitch propeller and thruster systems. 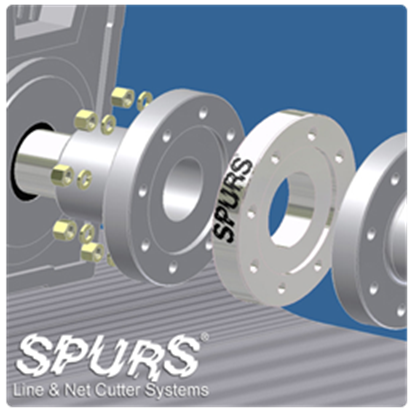 UNTIL NOW, SPURS® HAS BEEN WELL KNOWN FOR OUR LINE, NET AND WEED CUTTERS. DUE TO POPULAR DEMAND, WE HAVE DEVELOPED THE SPURS® SPACERS. THE SPACERS ARE INSTALLED BETWEEN THE TRANSMISSION AND SHAFT FLANGES TO EXTEND THE SHAFT. THE SPACERS ARE COLD-ROLLED STEEL AND NICKEL PLATED, TOLERANCE .001 FOR ALL DIMENSIONS, AND ONE INCH THICK (STANDARD). SPECIAL ORDERS CAN BE MADE FOR THICKNESS OR SIZE.